Arguing with our partner often leaves us feeling tense and regretting we had to deal with an uncomfortable situation. We may just have it all wrong. The purpose of an argument is not about dominating the conversation and looking at it from one’s selfish perspective. It is not to host a shouting match, or to get one’s own way. It is not an outlet to release all pent-up and unspoken frustrations. An argument is necessary to create understanding of situations, hurtful words, and various actions that causes us to either feel unloved, unappreciated, disrespected, betrayed, deceived, or unworthy of trust. We need a strategy to have an argument, so that once engaged there will be a solution both partners can agree on, and become stronger together. If you and your partner share a closeness, and more understanding of each other after an argument, then both of you are handling your arguments in a way that builds a stronger relationship. On the other hand, if you feel frustration, pain or anger, your arguments are creating division and misunderstandings. 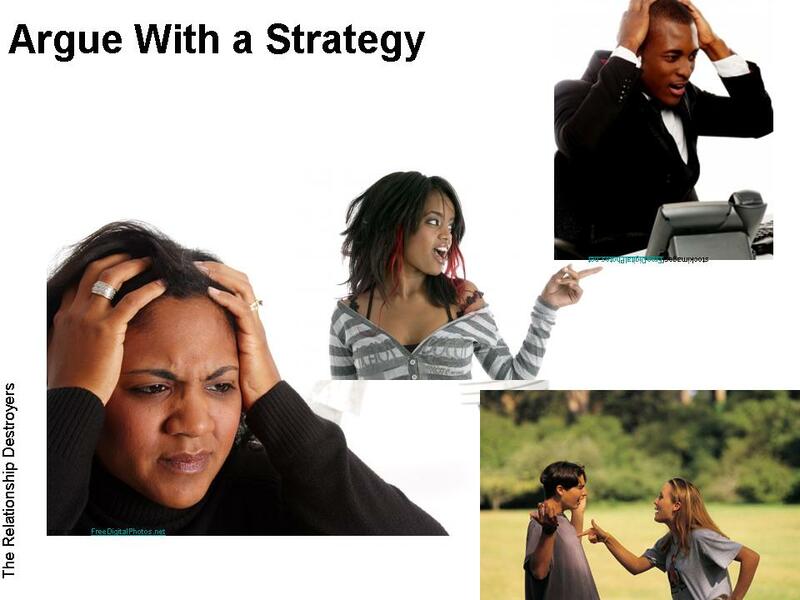 The next time you have an argument, why not use a strategy to work towards a solution? Find out what the problem is exactly. This is necessary in removing the problem permanently, never needing to be addressed in that way again. Repeat some of the points to assure your partner that you understand how he/she may feel. Be empathetic and ask questions. The “He Say, She Say” has no place in a relationship. Most folk we talk to are biased anyway. Unfounded accusations build barriers. Everything is worth talking about, but everything is not worth arguing about. Yelling and screaming gets you nowhere. The problem is intense enough. Yelling creates defensiveness, and will cause your partner to avoid you or walk around on egg shells in fear of pressing the wrong button that sets you off. If you have a partner that rants, go in neutral mode. The ranting partner is not listening and barely communicating. Avoid bringing up the past, because it opens up old wounds, and bring other emotions into the argument. This derails the conversation from the issue at hand. Address the problem and that problem only. Deal with each problem as they come, so that the past is not a problem in the future. Shutting down only intensifies the problem into unnecessary proportions of silence. In an argument silence is a relationship destroyer. Do not hold off on having a discussion. A sense of urgency in needing to talk places importance not only on the problem, but your relationship. Skipping the subject is a cowardly act. So is agreeing with your partner just for the sake of ending an argument. If you have nothing to say, it would be helpful to explain why. This usually applies to the responding partner who is being addressed with the problem, but unaware to his/her partner’s impact of the problem. This is okay. You may not get it, but listen to your partner’s concerns, and be concerned because he/she is. No relationship needs drama. Drama should be removed. It is a destroyer. Being logical makes no room for drama. Objectivity is mostly always coupled with the necessary discipline enabling you and your partner to have a discussion that will bring solutions rather than open ended arguments without resolve. Refrain from feeling the emotions of selfishness, anger, frustration and pain. Rather than attach to them during a heated moment, detach from them. Pull out your brain first, and your feelings second, and watch how your arguments will be more of a benefit than a disaster. This entry was posted in Actions in Relationship and tagged no drama in relationship, Relationship argument, strategy in argument. Bookmark the permalink.